Next to beginning a relationship with Jesus and marrying Lisa, putting together a financial plan and sticking to it has probably been the 3rd greatest decision I have ever made in my life. Lisa and I started it 19 years ago and fully implemented it about 17 years ago. Today it has allowed us a ton of financial freedom that we could have only dreamed about. Yesterday at ExponentialChurch.tv I talked about it, but only gave the beliefs behind the plan,and not the plan itself. My point was this…”What you believe determines how you behave”. Until you change how you think about money, you will probably not handle it in a proper way. You can listen to yesterday’s message here. Part 2 of it comes this Sunday. However, at multiple points in the message I mentioned that I had also taught the plan in the past, so I thought I’d make it convenient to find all the proper links for it here. The “Mind Your Own Business” series was done in 2010 and then in 2013, I repackaged it with some up-dates as the “Strapped” series. I pray that this helps you in your journey! Please let me know what questions you may have or how I can help you. Lots of new faces and 6 more people came into a relationship with Jesus today! That’s now 23 in 3 weeks…I love that and made sure the crowd knew how to properly respond when lives get eternally changed at the end of the message. If you want to listen to what I said you can listen to both the message and words afterward here. I didn’t have a great night sleep last night so 6am came around waaayyyyy to soon. Frost on the windshield was not a welcome sight either. Mike Sellers and I drove around putting out the directional signs and my shoes got soaked. Also the ground was hard enough that pounding the signs into the ground was not easy. Can’t wait until we have some guys that attend the church that own trucks so Mike and I can pass off this early morning ritual. Oh well we get a work-out in before everyone else arrives at the theater. Not a bad day with set-up…everyone’s starting to get into a rhythm and each week we keep discovering new ways to make things faster and easier. We had 8-10 of our normal crew who were missing today for various reasons so it feels good that we pulled everything off as smoothly as we did. In fact we’re getting set-up so quickly that I’ll be giving everyone extra time next week to come in. I’m sure that’s music to their ears! So proud of our entire First Impressions Team…they’re doing an incredible job making everyone feel great about coming out. This is especially impressive considering all the new people that are coming through each week that aren’t quite sure what to expect coming to a movie theater for church. I met a guy who came today as a result of the special stuff we did the other night for trick-or-treaters. Amazing how just doing a little bit extra means so much to people and in this case convinced him to come check out the church. Really proud of everyone from Exponential who did the same type of things at their house…a true party with a purpose! The band rocked it today and it was fun having them do “The Monster Mash” as people filled out their Connection Cards. I guess because I was tired I didn’t feel I gave my best during the message time but obviously it connected enough that 6 more people are forever changed! 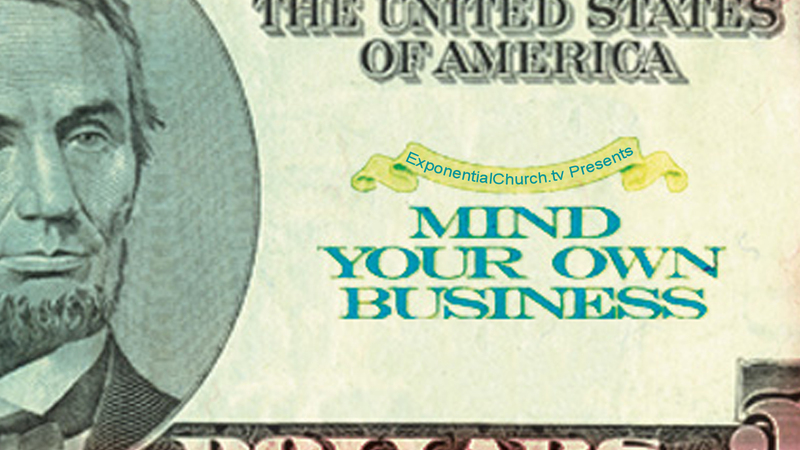 I absolutely can’t wait for next week when we begin the “Mind Your Own Business” series. I’ve preached this one before and it was amazing to see and hear stories of people having their financial lives changed. I heard a few audible gasps from people during the commercial for the series as some of the financial statistics came on the screen. It’s true that America is hurting bad so I can’t wait to teach God’s plan for handling money. I again want to encourage everyone to invite as many people as possible for this series…it will be one of the most practical series you will ever hear. All in all another great day and I can’t wait to see what God has in store for us as the weeks and months progress!